For the final assignment, a research paper outline, I chose to study cults and more specifically, the Rajneeshpuram cult that was popular in the 1970s in Eastern Oregon. Cults are particularly fascinating to me because there are so many studies done on them and the psychological reasons why people start and join. Rajneeshpuram has relevance to me because I’m from Oregon and often hear stories of when this cult was in its height. 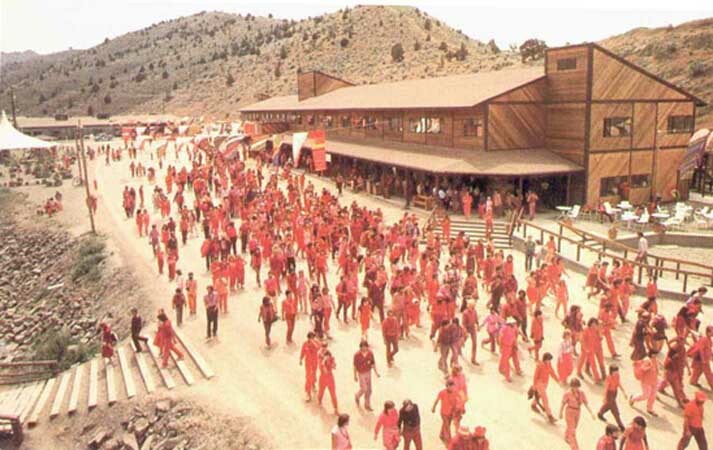 The members of Rajneeshpuram, a cult started in Eastern Oregon in the 1970s, initially joined this cult because they wanted to feel as if they were a part of an intimate community. Contrary to popular belief, many people join cults because of this aspect, not because of the religion or even because of their own mental state. I used research to back up my point about community being the main reason why people join cults and built off of that to create the outline for my paper. Exploring this cultural group or identity more in depth was very interesting to me and I think by doing the full paper instead of just the outline I would have been able to understand the group a little better considering how much research there is out there about Rajneeshpuram and cults in general. For my studio project, I zoomed out and focused on cults in general instead of focusing on the Rajneeshpuram cult. I constructed a cape pattern meant to be connected with other capes which relates well to the paper I wrote all about community.